And so, the second design-a-childrens-game GDS I enter, again ends poorly. 6th out of 8th place. And this time I thought I nailed it. Not taking away anything from the other entries, mind you. My mindset here was to try and re-create a simple game from childhood, with all the maleable tendencies that those usually have. So it had to be simple, involve a lot of running around, and some fairly useless scoring, which provides more to a means to an end than actually winning anything. Oh sweet Calvinball. It needed to be a game with no rules judge, no specifics, a little like controlled chaos. It essentially became a cross between "Running Bases" and "Ghost in the Graveyard," and it allows for endless variation of players and play yards/parking lots, with very little structure and "oh yeah" rules. In fact, I think I captured that well. Apparently, maybe the game needed a little more structure and complication given who is voting. Oh well. And now, a classic "Ghost in the Graveyard" moment. It was the second year of college, and a huge group of friends gathered at a friend's house after everyone had their family Thanksgiving dinners. And it was decided to play "GitG," somewhat similar to the game I presented: the Humans had to circle the house four times, while the "ghosts" slowly grew their forces by tagging humans as they went. Being late November, it rather dark (but warm for the season). As I ran around to the backyard in the dark, my neck caught a clothlines dead center, and much like Wily Coyote, in what felt like slow motion, flung me backwards AT LEAST 20 feet (well, so it seemed), landing on my back. So here I am, grasping at my throat wwhich was nearly garroted and choking, and having a hard time breathing from landing sqaure on my back. One of the girl who was a ghost at the time comes running over to me, tags me, and says "Your It," and leaves me to my collapsed-esophagus death. Well, I didn't die, but had a NASTY rope burn around my neck for a few weeks, looking like I was saved from the gallows in the nick of time by a well placed Robin Hood arrow. One player is randomly decided to be the GHOST, and will be the first member of the Ghost Patrol. All other players are THE GOOD GUYS. Give the Good Guys a small ball (or Frisbee, or some other thrown toy). The Ghost selects 3 BASES. Bases should be relatively thin, and hard to hit with a ball when thrown from a distance, and also in a pre-defined area that the players choose. Young tree trunks, lamp posts, or grandmother’s walking cane may make good Bases. Depending on the age, and number of players, the Ghost may have to select more than three Bases. The goal of the game is for the Good Guys to move the ball and touch a Base three (or whatever number is appropriate to the skills and amount of players) times. The Good Guys may run with the ball, hide the ball behind their backs (attempting to fool the Ghost Patrol into who has the ball), may throw the ball to each other, or even try and hit the bases with a thrown ball. The ball cannot tag the same Base twice in a row. The Ghost can tag Good Guys to turn Good Guys into Ghosts and add them to the Ghost Patrol. However, a Ghost cannot tag a Good Guy touching a base. A Good Guy touching a Base may yell “freeze” at Ghost guarding him (waiting for the Good Guy to leave the base). That Ghost must then stand still and count up to 20 as fast as he can before being unfrozen. If a Ghost gains control of the ball, or tags a Good Guy with the ball (turning him into a Ghost in the process), the Ghost Patrol wins. If the Good Guys win, the last Good Guy to hold the ball becomes the new Ghost for the next game. If the Ghost Patrol wins, the original Ghost can be the single Ghost again for the next game, or a new Ghost can be appointed. When I want to refer to something that are "warriors who fight on horseback in combat," I should spell the word "Cavalry". When I want to refer to something that is "hill in which Jesus was crucified," I should spell the word "Calvary". Which explains why Word didn't catch the misspelling. I had someone email me recently asking a few questions about PocketCiv. In general, I find such questions pretty interesting, no matter how insignificant. If someone is willing to take the time to pose a few questions about a game to me, that pretty much means that something about the game has hit a nerve, and that they enjoyed the game. Ultimately, noone cares about any background or balancing issues on games they hate. Thankfully, I've been somewhat surprised about the amount of email I've gotten, including one from someone who wanted to translate the rules to spanish (YES! PLEASE!). Anyway, here's the gist of one question that I thought was interesting, mostly from an aspect of where my mind was at the time of a design decision. "When comparing the costs between a Giant Gilded Statue of Yourself (4 Tribes, 20 Gold, and requires Art, for 15 VP) and Huge Monolith of Impressiveness (4 Tribes, 10 Gold, no requirements, for 12 VP), why would you even bother to build the GGSoY - it requires Art and 10 extra Gold to build." Well, you know what, he was right. From a pure game design and rules standpoint, there is no good reason to build a GGSoY compared to the Monolith. But from a esoteric mental image of what's going on in the game world, to me, I'm ALWAYS going to be building GGSoY. 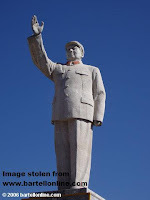 Heck, if I'm leading my people around, teaching them such simple things as Irrigation, Engineering, and Law, they better be building statues in my honor! Sure the Monolith may be impressive, but it's not me! To be honest, I never really have spent much time on balancing the VPs in the game. I was more concerned with if the game played fun, and was hard, but still possible to play through 8 Eras. That was the driving goal of the game to me: to beat the game through 8 Eras and to experiment with differently shaped worlds and figure out the puzzles of which Advances best suited the terrain I decided to play against. Scoring VP was pretty much secondary. Scoring really only came about because Advanced Civilization had it. I quickly did my best to think out some of the balance for VP to each thing as an after thought. But I forgot that a lot of other people play games for different reasons. And score is a main fuel for the fire for many people who play. Instead of seeing GGSoY as the abstract thing that it is (some little chit with text on it that scores 15VP when built), I see it conceptually as an entertaining motivator to canvass your Empire with giant gold likenesses of myself, lording over my little Tribes. Not that I'm this ego driven madman, mind you. I saw it more as a little side quest to do out of pure entertainment, just to be able to say "Look, I've got a little Easter island over here and they al look like me"
I guess you could do the same thing, plopping down Monoliths willy-nilly everywhere. But conceptually, that a series of overblown black bricks just isn't the same a bunch of muscle-rippling, heroically-posed, 50-foot high Scotts littering the view of the ocean. Of course, the author of the email is correct. While the concept is amusing, that really shouldn't be the thrust of the game. And changing the stats to better reflect the cost of the things doesn't change my mental concept; but the concept itself shouldn't be driving the balance issues. The equations should not include "because you will find it amusing to build this." I suppose this is why humor-based games fail. Once the joke is told, you usually find that the game behind the jokes is not very good. The equations to often include "you should do THIS because it is funny," and not "you should do THIS because it is a good play for you to make within the confines of the rules." However, I do think an exception can be made. Maybe it should slightly fit in the equation in a game where you really ARE placing giant, oversized plastic pieces on a board. Because, part of the fun is in actually playing with the giant bits. A lot of the draw to the collectible figurine games have this element. Playing with the pieces is a huge part of the fun. I'm not sure if HeroScape is much fun in a cardboard chit on played on a paper hex map. But man, a large set with a bunch of figurines running around sure looks like a lot of fun. Alas, PocketCiv has little colored chits that say "Monolith" and "Statue." The math will have to be fixed until otherwise. And so, instead of getting back into Leviathan which I sorely need to do, I’m still busy cleaning up some other items off my design list. Item number one of my “Things to Do List” is finished and shipped. Minsterpool is off to GCOM contest. Recently, I got an email detailing some information about the contest, indicating when each of the games will be played, and a short description of each game (there are 10). Of interest is that one of the names of the designers sounded familiar. A quick google search for “Andrew Parks” did, indeed, pop up a BoardGameGeek entry for him, with a few published games. I’m assuming he’s also demonstrating his game as it does not have an official “demonstrator” tag attached to it. Item two was tweaking PocketCiv a little bit. There’s a two-fold reason for this. One, from a game design standpoint, There’s been enough comments on the game about it’s ability to beat up players in the early Eras. So I’ve tweaked and scaled a few of the Events down a bit early on. The second issue is more of a marketing kind of thing. By updating the game, it gives me a really good excuse to keep the game “fresh” on BoardGameGeek, by bringing it up to the top of a forum list for a day or two. Like most things that go unheard, games on the Geek that don’t get much attention pretty much die a silent death. Conversely, every time PocketCiv gets a mention on a forum, it gets two or three more ratings. So, instead of just a blantant ad for the game, updating it periodically gives me a reason to re-introduce it. Occasional updates also indicate a certain level of “customer support” I’m willing to give, as opposed to just letting complaints and comments rot away into the ether. I hoping that this should make the geeks who are on the fence about the game have a little more interest in trying it out. And as item 2.5, I’m also experimenting with additional scenarios with PocketCiv based on a few comments. Also, I can’t say that I’m not influenced at least a little bit by my recent Nintendo DS games I’ve been playing. I’ll probably go in depth a little more on this project at some point. But in general, it works like this: unlike the first 10 scenarios, which were just a random collection of various setups and goals, this next set will follow a story line, building a mythology as the scenarios are played out. This is pretty much following the videogame model, where every little mode plays similarly, but advances an overall story. This makes the game somewhat more compelling, as the “story mode” pushes you along in the world. Unraveling hints about a greater world, and gives it a little “just one more page” addiction. Notably, this is a moderately small experiment for a board game format (even though I believe it has to have been done before; probably at the very least HeroQuest did something similar). And so, as the story progresses, new rules are added and abilities are learned. And, oh yeah, I’m adding magic to the mix using some new mechanics. So while I could just easily make the Advance Tree larger, or add a few new resource types (the easiest way to expand the rules), I am actively expanding the world instead, and trying out a different way to drive a solitaire game. Fun stuff to play with. Until I get annoyed. While I have no idea about how many other games, or what type, or really anything about my competition in the GCOM design competition, I know one thing, my game is going to win the non-existent "Best Packaged Game" award. Just click on the image off to the side to note the fine, American homemade craftmasmanship! Each element of the game sits in it's own compartment. The box is designed to make each category of component easily grabbed, yet, nothing shifts during "closed box carry mode." A wonder of engineering I tell you! And while I've given up the foamcore for component development, foamcore, due to it's rigidness, still works wonders for gamebox compartments. I would also like to make a note that Keen Footwear shoe boxes make excellent choices for prototype game boxes (or storage boxes in general). They are very sturdy and are all one-piece construction with a nice little fliptop, as opposed to two seperate pieces. Plus their shoes are pretty good. However, their website pretty much is a fairly unusable piece of Flash-tastic garbage, as it always loses sync with your mouse location when selecting shoes. Strangely enough, this behavior continues every time they update their site, so it's not just a one-time thing. Anyway, why all the fuss? Well, I think it adds a little professionalism to the package. A lot of people seem to huff and puff over Cheapass Games production values. A little "ooooh and ahhhh" over production values never hurts; especially in a contest. If I can get a few people excited about playing a game just based on the packaging, that's a few pluses in my book right there. And they haven't even played the game yet. If I can score a few points over the guy who wrote his rules on a napkin, all the better. Also, since my game is being assigned a person to demo the game (who, rightfully so, has no emotional baggage assigned to the game), I want my demo guy to be proud of what he is demo-ing, selling to the other poor demo schleps who just got a pile of poorly cut cardboard. Well, that all sounds kind of mean. Hopefully, the other prototypes are a little better than that. Additionally, since I'm going to get the game back, and if it tests well at the contest, this will be my production submission prototype. It's like dressing up a little nicer when going on a job interview; first impressions make more differences than people care to state. And while a guy with a suit who knows nothing won't get the job, if it comes down between a guy with a suit and a slob who both have equal knowledge, the suit will most likely get the job. Or at least the one who seems to bathe regularily. I've noticed on Yehuda's blog, a patent that my name is attached to finally showed up. Here's a little lesson in patents, along with a little backstory. Pretty much all of this is kind of stale, musty history at this point, and all of the sordid details of the "smoke and mirrors" of how slot machines operate is pretty much out in the public if you go looking for it, so I don't think I'm revealing any corporate secrets (but you never know). Back in a previous lifetime, I worked at WMS in their upstart gaming department designing slot machine games. After a relatively hard fought bidding war between WMS and IGT (the 800-pound gorilla in slot machines). And I was assigned to design one of the original 4 Monopoly-licensed slot machines. There were to be two mechanical reel spinners, and two video 5 reelers, all four of them sharing the same basic top box shape, with independant bonus games. This is probably some time around 1996 or so. Fuzzy memories. It should be noted here that while I am typically saying "I designed," it really was a co-design process with Bill Grupp (another name you'll see on various early gaming patents with my name). So if I type things like "my design" or "I designed", it's more for efficiency sake of typing than anything else as it really was a co-design. Additionally, there are many others who actually work on a product to get it finished and provide substantial input, people like Greg Dunlap, sound guys, mechanical engineering people, OS programming people, QA testers, etc. And so, the game that we wound up designing was the version known as "Advance to Boardwalk." While I can't find any good images of the real casino game floating around on the internet, I did find the handheld version of the game that Mattel produced, so that's the picture I'll show off to the side here instead. Actually, at the top of this post, you can see the lawyerly drawing of the game from the patent itself. As usual, clicking on the images will give you a much larger view of the picture. The other mechanical reel spinning game was called "Roll and Win;" the two video spinners were named "Once Around" and "Reel Estate." At the time, all four games were wrapped up into one giant patent. It appears that at some point they've broken them up or something. I haven't been following this too closely, so I'm not quite sure. 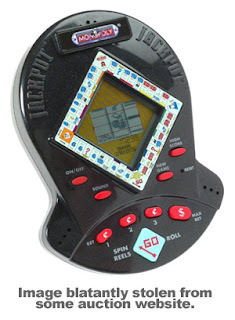 Anyway, you might wonder why a game invented back in 1996 or so is getting awarded patents 10 YEARS LATER. Well, here's how the system works. In general, even though the name of the patent is "Gaming Machines With Board Game Theme," that really isn't what is trying to get protected. Well, maybe it is, sort of. The important parts of a patent is your CLAIMS. The claims are things that you are trying to protect as your "new and unique" inventions. (of course, "new and unique" being questionable in many cases, but that's another discussion for another day). And in your first pass at these claims, you usually try and cast as wide as a net as possible . Only through back and forth haggling between your patent lawyers, and the patent lawyers at the patent office, do things get essentially boiled down to a description of what everyone feels is truly "new and unique" about your invention. So, while initially, you could be very broadly TRYING to get a patent on any and all gaming machines with board game themes, what you actually wind up getting is protection specifically geared towards your own implementation of your board game-like gaming machine. Side Note: Getting a patent on a board game in a slot machine would be VERY hard at the point in time when this was originally being filed, as British "fruit machines," or AWP (Amusement with Prize) machines have been combining basic slot machine play with board game elements for years prior to this. How specific your claims are really determines the value of your patent. If your patent only covers a particular game VERY specifically, it doesn't take much to work around that patent andin this case develop another board game variation. Loose claims cover broader areas, and grant you more protection, but are harder to "sneak by" the patent lawyers, and quite possibly, could be open to interpretation with "prior art" (something that was invented before your invention) that could make your claims invalid. Anyway, as you can probably guess, all of this starts to take up a lot of time, and a lot more money. And it's why you don't frequently see board game patents. It's not worth it. If you notice on the given patent, under the heading of Parent Case Text, there's a whole large line describing continuations under REFERENCES TO RELATED APPPLICATIONS. This is sort of history of "how we got to this patent" from an original patent. Once a patent is issued, you cannot change the patent. However, a contunation will let you make additional claims based on your original patent descritions, with the advantage of this being that it makes these newly claimed protection backended to when the original patent was published. Ultimately, you do this because A) it makes it easier to get the additional patent protection, B) you've realized you missed something in the original patent, C) you have developed an additional invention based off the original design, or D) you see that someone else has developed a workaround your original patent, that is already described in your original patent, so you are going to now claim it. Anyway, while my name is still a part of this patent (since you can't remove names from an invention once it's filed), this patent in particular really doesn't cover any claims based on my original Advance to Boardwalk design. Instead, it covers some additional patents that WMS feels they've missed from the original patents in regard to the other games. This patent seems to deal with exclusively a board game bonus that uses mechanical, rotating dice to mave around a board. A) A bonus game in a gaming machine that includes a board game where, as you move around around the board, you get an ever-increasing award each time you pass a particular space. This is effectively the "Pass GO" rule (described later). B) This next one is the patentable feature that I feel winds up making AtB special. It is claim number 6 in patent US 6,508,707 B2. Basically, what this states is that as a player moves around a board in the bonus game, the next space chosen is determined by a random, but weighted, movement table associated with the player's current space. What does that mean? Well, here's how the AtB bonus game works. When a certain set of symbols land on the reels, the player moves up to the bonus game, which uses the Monopoly board on the top box. Each space of the Monopoly board is independently backlit. Below the Monopoly board is a dot matrix display, which provides for the "dice rolls" (to be discussed later) to move the player around the board, shows the credits that are awarded as the player moves around the board, plays little minigames for credits (Free Parking, Electric Company, Water Works), shows animations for Chance and Community Chest spaces which can award credits or move you around the board to other spaces, and other amusing animations. Ultimately, once the game starts, the game pretty much runs on auto-pilot, moving the player around the board, collecting credits. The game ends when the player lands in Jail, or one of the Tax spaces. Additionally, every time the player passes Go, an incremental bonus is awarded (the "Pass Go!" patent concept discussed above). 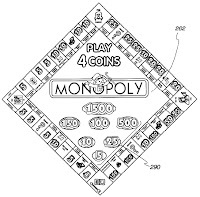 Looking closely at the diamond shaped Monopoly board graphic off to the side here, you can see the credit values shown for each space (even though in this graphic stolen from the patent, the values are wrong for Boardwalk and Park Place, they should be 500 and 250). The incremental Pass Go awards are shown, and backlit when collected, in the middle of the board below the Monopoly logo. The patentable concept here is that, even though the dot matrix display picks a number between 2 and 12 to move the player, it is not your usual bell curve of probabilities that one would expect from throwing two dice. In fact, the odds of any given movement number changes based on what space you are currently at. In other words, each space has it's own odds table for movement numbers, which allows for the designer (me) to better control how the player moves around the board. And these weighted odds are very highly skewed. If you are asking, "why would I want to do that," here's the reason. If you were really playing the game based on "true dice odds," the chances of landing on any particular space over the course of the game would be close to identical (with rare exceptions). This would mean that the payouts for landing on Boardwalk would have to be almost the same as landing on St. Charles. There would be no big numbers to root for. By changing the odds at any given space for movement, I can have the player "avoid" the larger payoff spaces, and "target" certain other spaces, like "Chance". If all of this seems like cheating, I admit that it sort of is; however, the concept of weighted odds is pretty much the language of the slot machine. Typically, as long as you don't imply that you are giving our true, expected odds when in fact you are really using weighted odds, you are free to use weighted odds at your leisure. So, when we are displaying the movement number on the display for how many spaces the player moves in AtB, we don't show Rich Uncle Pennybags throwing dice (as this would imply true dice odds). Instead, Rich Uncle Pennybags is sitting behind a weird little computer bank device (similar to the bank of switches that Homer Simpson sits behind at the power plant), and our good Uncle is feverishly throwing switches and levers, which then reveals a movement number on a monitor. Which implies that the number picked isn't even random, but pseudo-selected somehow by somebody or something. And how does this story end? Ultimately, out of the four original Monopoly games, AtB is the only original Monopoly game that I've found still at a few casinos on the Las Vegas Strip. Which is quite amazing, considering that it is close to 8 years old. In a marketplace that routinely gives machines only 6 months to live before they are rotated out with something new, as has happened many times already with the video Monopoly machines (WMS usually cranks out two new video Monopoly games a year as "refreshers" to the existing machines on the casino floor), a game that has that kind of legs is pretty astounding. After my almost-a-full-month-away-from-my-desk, I'd like to try and get my head back around to finishing up Leviathan, but that's not going to happen for a little while. I submitted Minsterpool to the GCOM Game Design Contest, which passed the first round (a cursory read over the rules), and so I'm working on a prototype to ship out to them. Additionally, I had wanted to go back and rework some PocketCiv stuff based on the trickles of information coming in through boardgamegeek. I had attempted to submit Minsterpool to Hippodice earlier, but apparently that email got lost somewhere in the ether, as I didn't hear anything back from them (which they traditionally do respond back either an "yea" or "nea"). So, I guess this will be a good trial run for later this year. It's probably my tightest game, "tight" being a strange term in that I'm not really sure what the definition of tight is. The game plays very cleanly (well, at least in my online playtesting of it), is pretty simple, and is not language-dependent. Somewhere down the line, I'd like to expand upon it; but not in the usual expansion way. Right now, the game is solely about gaining influence over the various court members. And that's it, points for control. I envision a much larger purpose for this. I imagine an add-on game where controlling each court member actually let's you play out those court members on another board; and that's where you score your points. So Minsterpool is just one basic mechanic in the scheme of a bigger game that will play out. But that's for later at this point. As I'm working on this prototype for the contest, one of the more interesting things I've discovered is that getting things printed out at Office Max on their color laser printer produces really nice results which don't smear under the use of sticky, wet fingers. Normally, I print stuff off my home inkjet, and then have to laminate it, so this has relieved me on a step. Also, I decided to try out using some Bienfang Master Illustration Board as a backing for the "boards" instead of my usual foamcore. And results are impressive. Now, I might have to shell out the extra 10 bucks to get my game back from the contest since this proto is coming along so nicely. Guess I'll be dumping the foamcore method from now on.